With just over one month to go before the Superyacht Rendezvous Montenegro, we are delighted to reveal some of the world's most elite motor yachts who are joining us. The Rendezvous has always been a magnet for Superyacht Owners and their motor yachts and the 2015 edition, in its new location of stunning Montenegro, is no exception. The Pershing 115’ stands out particularly for the distinctive originality of her sleek and dynamic external profile as well as for her extraordinary performance and insistence on superior comfort. The La Cima IIImaxiyacht embodies the best of the shipyard’s style in terms of the refinement of its finishings and the superior quality of the components used for its furnishings and of the materials employed. The revolutionary design of the yacht’s external shape has also allowed a series of hitherto impossible, interior environments to be created. La Cima III is one of Pershing’s most ambitious creations to date and offers the pleasure of space designed according to a concept where luxury and privacy are paramount. Elena was victorious at the World Superyacht Awards 2015, taking home a Neptune for Displacement Motor Yacht of Below 500GT of 44m and above. Elena is a full displacement yacht that belongs to a breed of Heesen’sthat are icons of classic, contemporary yacht design. With zero speed stabilizers, maximum comfort at anchor is ensured whilethe round bilge hull with bulbous bow powered by 2 MTU 8V 4000 M63 guarantees smooth and safe cruising in all sea conditions. Between her delivery at the end of June 2014 to the Monaco Yacht Show in September she sailed more than 5,500 nautical miles taking her owners from the Scandinavian waters (where she cruised for her maiden voyage) to the Mediterranean sea. Exuma is a newly developed motor yacht design that French naval architect Philippe Briand calls Vitruvius, with the keywords ‘further, greener and sleeker’. Built entirely from aluminium, the Vitruvian yachts are long, lean and lightweight. Designed to create less resistance to the water than a conventional displacement hull, they consume significantly less fuel and therefore emit relatively low quantities of CO2. The Italian classification society RINA awarded Exuma ‘Green Yacht of 2010’. This sleek greyhound of the oceans has a knife-like bow, delicately curved and almost vertical, designed to increase waterline length and minimise pitching. Adding serious distinction to Exuma’s minimal superstructure and long foredeck are the convex glass windows that ring her bridge deck. Ingot was custom built using only the finest materials available. From her 4 stroke DDC-MTU engines to her beautifully hand crafted interior woodwork, her pedigree is of the highest integrity. Many added design features such as beveled mirrors and custom woven carpeting throughout provide immense eye appeal to even the casual observer. Ingot has enjoyed the winter in the Caribbean and joined us in the British Virgin Islands for the Loro Piana Caribbean Superyacht Regatta and Rendezvous 2015. Komokwa was built by Horizon Yachts in 2009 as Bikini Queen 2 and later renamed Rob Roy before she was purchased by her current owner in 2012. She is mid-way through a round the world cruise having left her home of Vancouver in October 2013, visiting San Diego, Cabo San Lucas and Puerto Vallarta she then cruised on the South Pacific before returning to the Mediterranean for the Superyacht Rendezvous. She plans to continue on to the Caribbean and New England and after that, who knows! Paraisoi s a classic motor yacht built in 1983 by Feadshipwith Jon Bannenberg responsible for her beautiful design, both inside and out. The yacht has a steel hull with a aluminium superstructure with a beam of 8.50m and a 2.40m draft and three decks made from Teak.This custom semi-displacement yacht is equipped with an ultra-modern stabilization system which reduces roll motion effect and results in a smoother more enjoyable cruising experience. She also features bow thrusters making her more manoeuvrable at low speeds. In addition to the yacht entries we are delighted to announce two new sponsors joining us for the Superyacht Rendezvous as Event Associates: Misahara and Trieste Chamber of Commerce, both an integral part of the event. Misahara will be showcasing an elegant jewellery collection during the Yacht Hop on the first evening, and hosting the cocktail reception during the Superyacht Rendezvous party at the Porto Montenegro Yacht Club. During the Welcome Cocktail and Yacht Hop, Trieste Chamber of Commerce are hosting a cocktail competition between the yachts that will be judged and a prize awarded to the winning yacht. Misahara collections reflect the wanderlust and adventurous lifestyles of the people behind it. The luxuriously handcrafted jewelry collections is influenced by designer Lepa Galeb-Roskopp’s Balkan roots and multicultural lifestyle. Each Misahara design is a translation of Roskopp’s experiences, drawing influence from the beauty of nature’s elements such as the Adriatic Sea.The traditions and inspirations of the past and present are our jewelry house guidelines for creating collections that last an eternity. All Misahara jewelry is handmade in New York by experienced jewelers who have worked with some of the world’s most prestigious jewelry houses. Misahara evokes a feeling of exquisite luxury, channeling an upscale, bohemian flare marked by unique handcraftsmanship and the finest quality diamonds, precious and semi-precious stones as well as precious metals. Trieste Chamber of Commerce is a local organization of businesses and companies in Trieste with the intention to develop and further the interests of local companies and businesses in Italy. Many businesses are international operating companies with offices in Italy. Members of a Chamber of Commerce are usually international and local operating companies, such as lawyers, property developers, tourism companies, airlines, manufacturing companies, import and export businesses, banks, finance companies, legal advisors, IT and electronics manufacturers etc. Chambers of Commerce main activities are, among others, safeguarding business interests and sharing business experiences and business interests, contact with governments, civil society, local media and the press and organising trade shows and events. 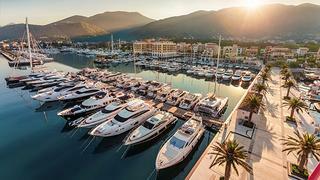 Dockage in the marina at Porto Montenegro from Thursday July 2 – Sunday July 5 2015. 8 x VIP tickets to all of the social events: Owners' Lunch, Welcome Cocktail & Yacht Hop, Cruise in Company and the Superyacht Rendezvous Party. Concierge service for yacht owners and their guests. To secure your place for the Superyacht Rendezvous please register via the website.